Have on hand 6 heatproof soup bowls or crocks. In a heavy soup pot, melt the butter. Add the onions and shallots. Cook over low heat, stirring occasionally, for 1 hour or until the onions are caramelized. Sprinkle the onion mixture with the flour. Cook, stirring, for 2 minutes or until the flour is absorbed. Add the wine, stirring constantly, then the stock and water. When the mixture comes to a boil add the bay leaves, salt, pepper, and Kitchen Bouquet. Turn down the heat, cover the pot, and let the soup simmer for 1 more hour. Taste for seasoning and add more salt and pepper, if you like. Set the oven at 400. 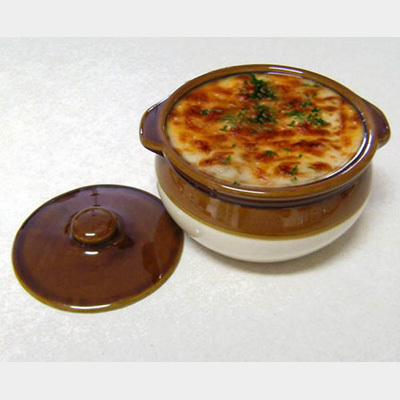 Ladle the soup into the Onion Soup Bowls. Arrange 2 slices of baguette on top of each, and sprinkle with cheese. Set the bowls on a rimmed baking sheet. Cook the cheese until the top forms a golden crust.